Everyone at UPD is invited to participate, from officers to dispatchers to clerks. Typically, officers are the most consistent and it is that consistency that has paid off. Twice a week, officers head to Maldonado’s gym for 45 minutes of cardio and weight work, and 15 minutes of sparring. As you’d expect, people who exercise regularly improve their physical fitness. With the increasing violence related to gangs and drugs in Mendocino County, officers must deal with more frequent and more confrontational calls. And, with a city budget crisis, hiring more officers to handle the additional volume is not an option. Under tough conditions, UPD is trying to make the best of the situation. According to an ICMA Center for Performance Measurement study, UPD has one of the highest ratios of violent crimes per police officer, but even with a heavy workload, UPD continues to solve 89 percent of its felony crimes. Dewey credits his officers and staff. They credit his leadership. They’re both right. 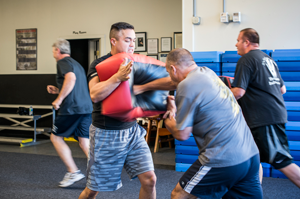 In this example, Chief Dewey’s foresight to setup the classes gave UPD employees a place to exercise and improve self-defense techniques; it also provided a time and place for trust and camaraderie to grow. But the classes are voluntary. By choosing to participate, officers and staff have made the experience valuable. Maldonado welcomes everyone who is serious about working hard and willing to support others in the class. He leads by example and, according to class participants, is one of those people you really don’t want to disappoint. “Respect. Loyalty. Discipline. Confidence. Quitting is not an option. Work hard or go home.” These are the things written on the gym walls. Talking to class participants, you begin to realize that the physical benefits are only the beginning. The real transformation has been in the additional mental strength and confidence they’ve gained in themselves and in each other. Maldonado shared his philosophy toward self-defense and the importance of learning through doing. “There’s a natural fight or flight response, but you can learn to control it,” he said. He explained that practice allows you to think and behave rationally, even in the midst of your body’s natural, physical reaction to crisis – racing pulse, massive rush of adrenaline. The UPD classes are specialized. They provide scenario work, forcing officers to respond to threatening situations in a controlled environment so they can test themselves under pressure but without the danger. He continued, “I tell people, ‘Be here now.’ When you’re hit, you have to accept it and move on. You can’t get angry. Say to yourself, ‘I made a mistake.’ And get over it.” He warned that getting angry and losing focus is dangerous and ineffective; remaining cool and in control is the safer, more effective way to handle confrontation. “Success during a fight often depends on surviving the initial attack,” he said. 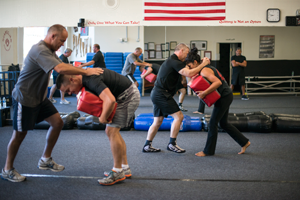 As officers get better at responding to attacks, they gain confidence in themselves. As they watch their colleagues improve, they gain confidence in them. As they all support each other through the hard work, they become a more cohesive team. And sometimes that confidence is enough to avoid violence all together. When an officer has excellent command presence, he or she doesn’t have to say a word but the perpetrator can almost hear the officer saying, “If you come at me, I will defend myself. If you hit me, I will respond with power and precision – and you will go down.” That’s enough to dissuade some folks. “And, the stress relief is huge,” Officer Long said. Lots of officers include exercise on their list of to dos, but having a class like this makes it happen. “This class is awesome,” Officer Long said, as everyone in the class nodded enthusiastically in agreement. 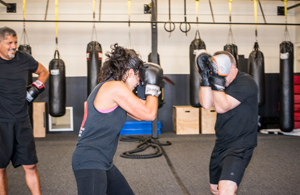 Comments on "Ukiah Police Department Builds Muscles and Camaraderie"